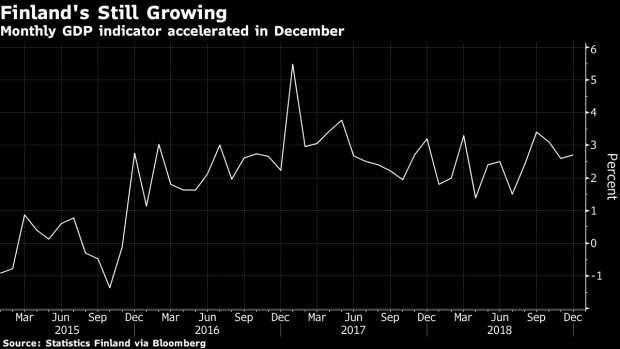 (Bloomberg) -- Finland’s economic growth accelerated to 0.9 percent in the final quarter of last year from the prior three-month period, flash estimate data by Statistics Finland showed on Thursday. The flash estimate showed a 2.7 percent increase in the fourth quarter from a year ago, which, if confirmed, would put Finland among the fastest growing nations in the euro area after years of being among the laggards. The government will be pleased to see good growth, with just two months to go until a general election and polls showing an opposition lead. Even so, the party may be over soon, with signs of construction cooling, global growth easing and leading confidence gauges falling clearly below recent years’ high levels. Timo Hirvonen, chief economist at S-Bank and FIM, said that while economic growth was strong in the fourth quarter, risks to the outlook have increased at the start of the year and political uncertainty is elevated. A slowdown in the euro area, a key market for Finland, dampens the outlook for exports. --With assistance from Leo Laikola.